Most non-Catholic Christians, unless they come from a liturgical tradition such as Orthodoxy or Anglicanism, only celebrate two major religious holidays per year- Christmas and Easter. 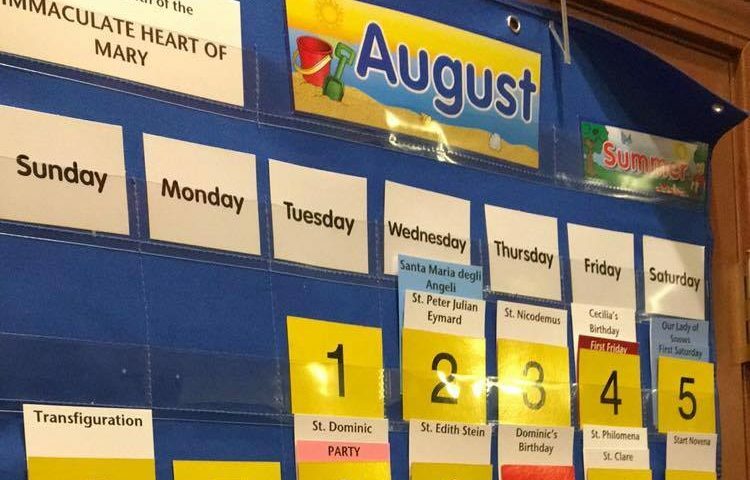 And while there has been a revival of the observance of Lent in some Protestant Churches, it’s still a drastic change for converts to Catholicism, once they realize that the liturgical calendar is literally full of feast days; there’s a saint, and usually multiple, for every day of the calendar year. That, plus the added observance of Holy Days such as the Annunciation and the Immaculate Conception, means that for Catholics, the calendar is practically exploding with opportunities to incorporate faith into daily life. How has embracing the liturgical calendar impacted your faith life? What are some of the feasts and observances that have become particularly special to you? How has the cycle of holy days and seasons helped you grow in your Catholic faith? “When we were Baptists, our year revolved around a mostly secular calendar. The only times when our calendar was given over to Jesus were Christmas and Easter – and the Christmas celebration, as an example, ended on Christmas day. In that way, we still went along with the commercial celebration of Christmas. We lost the joy of the full celebration of Christmas from December 24 to the Feast of the Baptism of the Lord. “A long time ago in a galaxy far, far away, I used to be Anglican. It was my spiritual heritage, and I loved the liturgical aspects of it, but I left Anglicanism because of the theological and moral waywardness of its teachings. I ended up being in some very anti-liturgical, but very devout, Protestant congregations. “Liturgy, and the Church Calendar in particular, was one of the major draws for me when I made the decision to be received into full communion with the Catholic Church. I’ve long loved the rhythms of the Church Calendar, even as a Protestant, and the way they unveiled truths about reality. I particularly love the non-identical repetition involved. Every year begins again with Advent and yet this Advent is not the same as the last, not precisely. This is true not only because it begins on a different date each year, but because time continues to move forward, but not in a line, rather in a spiral. Thus we continue to return to the same spot each year, but on a different level, ever moving closer to eternity. Second, as I read the daily Mass readings and prayers I am comforted to see that spiritual ups and downs on the journey are the common experience of all believers. The readings and the liturgical seasons reflect that truth. “This is s great question! I have been a life-long Catholic and had a spiritual awakening in my 40’s. The liturgical calendar guides my faith daily. I look forward to which of our saintly brothers or sisters to learn about or ask for prayers. It has given me a much broader view of the church and who we are. “Living the liturgical calendar is like breathing with the lungs of the Church. Especially as a mom of young children, I lose track of things pretty easily, but I know that I can pick up the Mass readings, pray the Divine Office, or celebrate the daily feast and be at once in union with the prayer and mind of the universal Church. “I know for me personally, once I discovered there were more feasts on the calendar than just St Patrick’s Day, I started looking literally every morning to see which saint, or groups of saints, were designated for that date, and resolving to know more about them. Getting into feasts and seasons was one of the most tangible ways for me to learn the ropes of living like a Catholic. I thoroughly enjoyed researching how different saints and feasts were celebrated historically and in different cultures, and even if it was as simple as just saying “St. So-And-So, pray for us” at mealtime that day, it was a major upgrade to my daily prayer life. What about you? How has discovering and embracing the liturgical calendar as either a new Catholic, or a returning Catholic, impacted your faith life? Please share in the comments below!